Diverse backgrounds and a dedicated vision characterize the management and science team at XSpor Life Sciences. 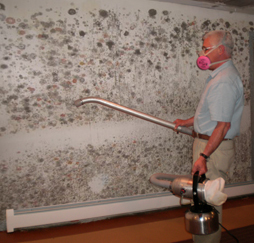 Peter has a thorough knowledge of the mold remediation industry, gained by founding an earlier company working in the field. His energy is complemented by experience in corporate finance. Dr. Cardaman has broad experience in the commercial, medical and academic communities, which includes working with regulatory agencies. He consults on mold issues throughout Florida. Dr. Ahrens knows the processes of developing a product and bringing it to market. His experience encompasses the medical, agricultural, energy and food industries. The actual application of XSpor's cleansing treatment, EnzyCleanse, requires minimal disruption. Because the treatment is applied in mist form it is helpful to move furniture and other objects away from the moldy area to ensure air flow. Delicate items should be covered, and the removal of plants and pets is recommended. The XSpor technician walks through the area directing the fog consisting of 10 micron particles to the areas where mold is most evident. The spray nozzle can reach ceilings and into duct work. Generally, after only 24 hours the site can be returned to normal use.